A blog post by JMM Executive Director Marvin Pinkert. You can read more posts by Marvin here. The self-evident confusion in this question inspired today’s blogpost. 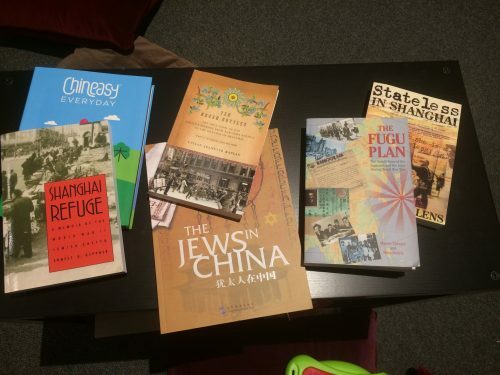 I realized that this visitor was under the impression that the JMM had created the Jewish Refugees and Shanghai exhibit when, in fact, most of it was designed and developed in China by the Shanghai Jewish Refugee Museum and “shipped” to us electronically. The translation was from Chinese into English, not the other way around and even this translation was done in Shanghai (with some editing for grammar and style by JMM). 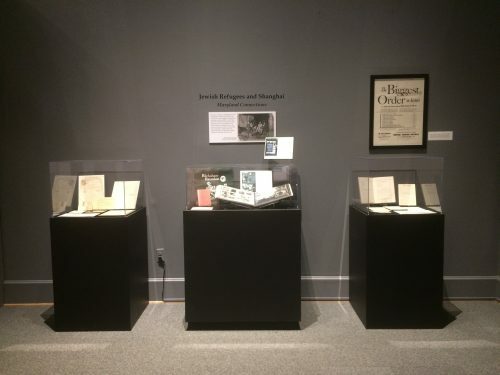 Only the three cases (and a small wall to the left, not pictured) that connect the story to Maryland were actually curated by our exhibits team. Don’t get me wrong. I’ve been really pleased with the response to the exhibit. We had wonderful feedback from our Members’ Preview event on Feb. 2. Two Sundays ago, demand for the program with Dr. Oyen was so high that we had to take down the partition wall in the Orientation Plaza to accommodate the 140+ guests who wanted to hear the lecture. But the story above got me thinking about supplying some of the context that might not be self-evident in the exhibit. 1. This exhibit tells the story of the survival of the Jewish community in WWII, not the broader story of Jews in China. Though the exhibit begins in the 1930s, there has been a Jewish presence in China since at least the Tang Dynasty (618 to 907 AD). The earliest documentary evidence of that presence consists of letters from merchants following the Silk Road (Baghdad to the Chinese capital at Xi’an). By 1163 the first synagogue was built in Kaifeng (and at least two other Chinese cities have synagogues in the 12th century) (image via). These early communities were made up of Jews from Iraq and Persia – but over time, through intermarriage and conversions they became undistinguishable from their Chinese neighbors, except in their religious custom. In 1605, the first papal ambassador assigned to China, Matteo Ricci, was shocked to “discover” a Chinese community with a rabbi, a synagogue and religious rituals very similar to those he had seen in Italy. Over time religious life declined. 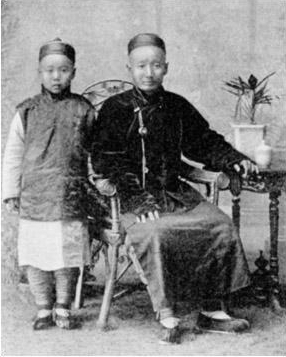 The last rabbi in Kaifeng died in 1810 and the synagogue was abandoned following the Taiping Rebellion (the most devastating civil war in human history – 20 to 30 million casualties). 2. The exhibit tells the story from a Chinese perspective. Several people have noticed the absence of a panel dedicated to Chiune Sugihara, the Japanese consul in Lithuania (image via). Sugihara courageously saves the lives of more than 2000 Jews by issuing transit visas to Japan. Those who escaped from Lithuania in 1940 ended up in Shanghai before the war’s end. By contrast, the Chinese consul in Vienna, Dr. Ho Feng-Shan, who also saves thousands of lives with exit visas following the Anschluss is honored with his own panel. Both men are recognized by Yad Vashem as Righteous Among the Nations. Why this discrepancy in coverage in the exhibit? This is, after all, a traveling exhibit from China and given the Chinese experience under Japanese occupation, I think some reticence to acknowledge Japanese heroes is understandable. 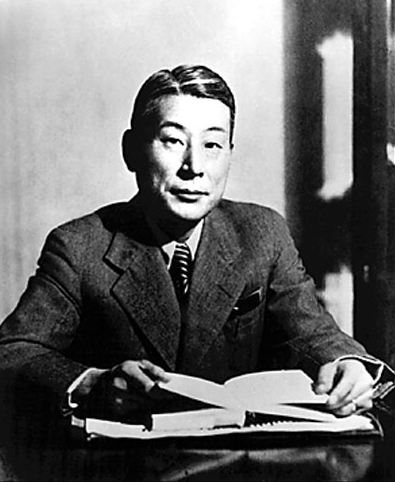 I suggest that those wishing to explore Sugihara’s life further might read Rabbi Marvin Tokayer’s account in the book The Fugu Plan, a copy of which we’ve made available in the mini-library in the center of the exhibit. 3. So who is responsible for Jewish survival in Shanghai in WWII– the Chinese? or the Japanese? David Sassoon (pictured in tuxedo) is among the first merchants in the opium trade and an early member of the International Settlement in Shanghai. I believe the answer to this question is very complicated – it’s both and it’s neither. Multiple factors contributed to the positive result. It begins with the circumstances that allowed for the creation of the “International Settlement” – a rare geographic zone that did not require entry visas. The pre-existing Iraqi and Mizrahi Jewish communities in Shanghai (including the great merchant families like the Kadoories and Sassoons) also played a key role in keeping the community afloat in the early years. The Japanese and Chinese consuls mentioned above both facilitated the escape from Europe. The Chinese provided some aid to their new Jewish neighbors after Japan established the Hongkou ghetto. 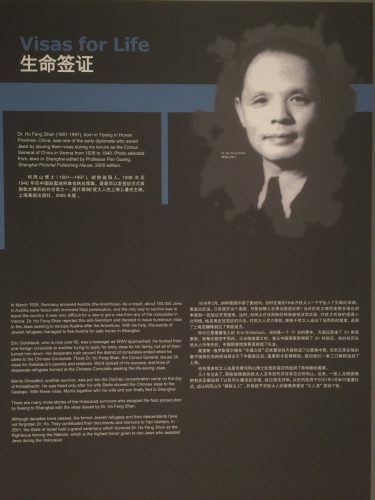 And finally, Japan’s resistance to the German Meisinger Plan for the extermination of Shanghai’s Jews was critical to the survival of the Jewish community (and is credited in the exhibit). 4. Can something awful lead to something good? To be profitable cargo trade needs to have full ships in both directions. But in the late 18th century, Europeans and Americans hungered for much of what China had to offer – porcelain, tea and spices. But China had little need of exports from the West. The British merchants had a solution to this problem. Ship a product to China that could be guaranteed to create its own sustaining market: opium. I regret to say that the Sassoons were among the British citizens profiting from the trade of opium from India to China. When the Chinese – to protect their population – seized the opium and jailed the merchants, it led to the First Opium War. China lost. And this led to the first of the so-called Unequal Treaties (the Treaty of Nanjing), treaties which effectively ceded pieces of Chinese territory to European control. America followed the British lead and also got a concession in Shanghai. 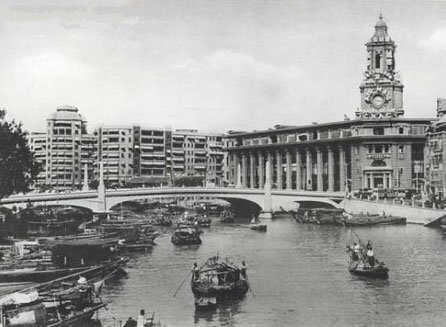 For the sake of improved commerce the American and British lands were combined to create the beginning of Shanghai’s International Settlement. Japan was able – through concentrated effort – to rescind the Unequal Treaties imposed on that nation … and eventually even eked out its own concessions from China. But the Japanese army wanted more. In 1931 taking Manchuria and by 1937 controlling large swaths of coastal China as part of its “Co-prosperity Sphere”– including Shanghai. Japan, however, carefully respected the rights of other European powers, avoiding conflict with the International Settlement prior to December 7, 1941. In this way, the greed of the colonial powers indirectly creates a haven for Jewish escape from the Holocaust. I hope you find these additional contexts intriguing and that you will take advantage of the opportunity this exhibit, and its associated programs provide for deeper exploration. 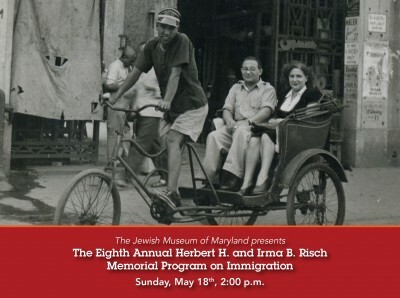 We are less than a month away from the eighth annual Herbert H and Irma B Risch Program on Immigration. This year’s program, to be held at Baltimore Hebrew Congregation at 2 p.m. on May 18, features Rabbi Marvin Tokayer. 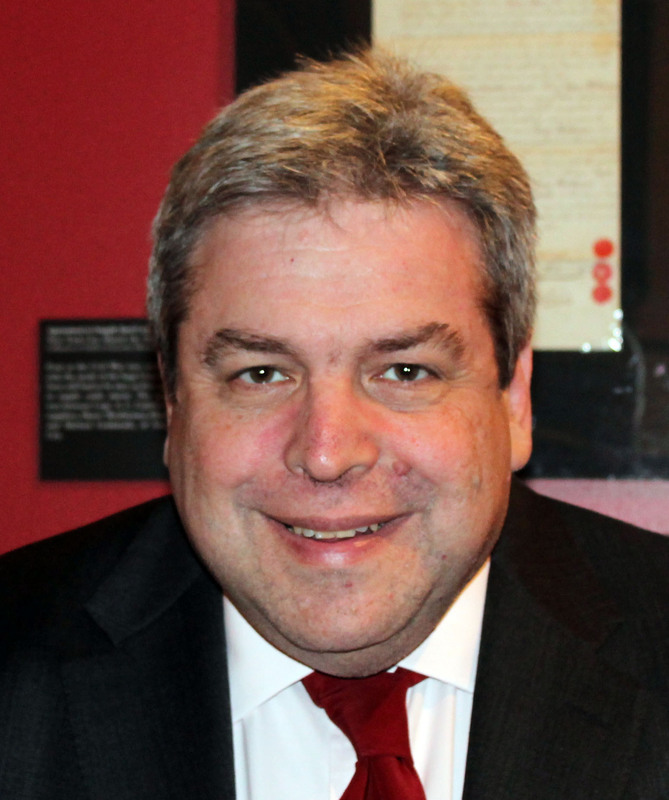 Rabbi Tokayer will be speaking on the topic of the Shanghai refugees, the remarkable Jewish community that not only survived WWII but also flourished in the years that followed (former Treasury Secretary Michael Blumenthal among them). 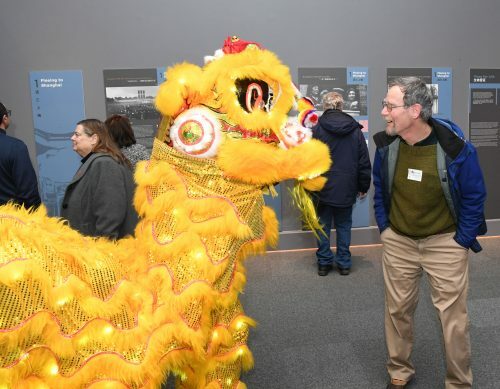 The selection of this year’s program was influenced by JMM’s current exhibition, Project Mah Jongg, and its focus on cultural connections between Jewish Americans and Chinese traditions. 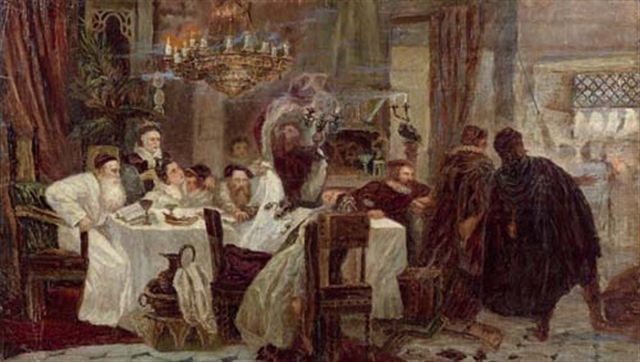 The connections between Jews and China are far older than most people think. The merchant trade of the Silk Road brought the first Jews to this part of the world by the time of the 8th century Tang Dynasty. When Marco Polo arrives in Beijing in the late 1200s he finds an active community of Jewish traders. Kaifeng contained perhaps the largest and most enduring Chinese Jewish population, preserving kashreit and shabbat well into the 1700s. Jews of K’ai-Fun-Foo (Kaifeng Subprefecture), China. Image via wikipedia. 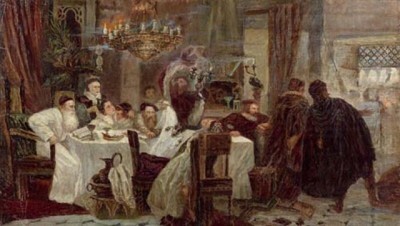 Marranos: Secret Seder in Spain during the times of inquisition, painting by Moshe Maimon. Image via wikipedia. In 1844, it was the opium trade that brought Elias David Sassoon, son of the treasurer of Baghdad, to China. Initially setting up shop in Hong Kong, Sassoon becomes the first Jewish member of the international colony in Shanghai in 1850. The big break for the Sassoons is the American Civil War. Suddenly, Chinese cotton becomes an important international commodity and Elias David Sassoon its most prominent dealer. 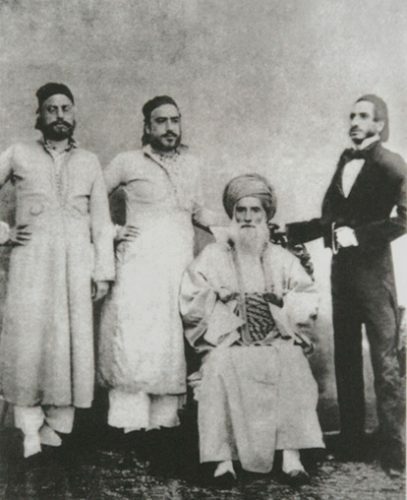 David Sassoon (seated) and his sons Elias David, Albert (Abdallah) & Sassoon David. Image via wikipedia. In the early 1900s, Jews fleeing pogroms in Western Russia, managed to make it across the Trans-Siberian Railway to settle in Harbin, China. 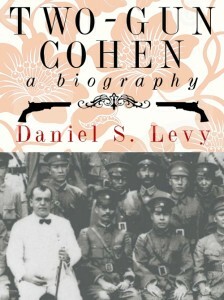 And perhaps the most interesting Jewish emigre to China is Morris Cohen (known more commonly as “Two Gun Cohen”). Cohen was a British born pickpocket, pugilist and con artist (as a boy, in a scene right out of American Hustle Cohen is employed by glazier, breaking windows to bring in business). After leaving reform school in England, Cohen headed to Saskatchewan, Canada where he was hired on as a farmhand and taught to shoot with a gun in both hands. He made an unlikely friendship with a Chinese restaurant owner in Saskatoon whom he saved from an armed robbery. This brought him into the inner circle of Cantonese Canadians who were supporting Sun Yatsen independence movement against the child emperor PuYi (think Last Emperor of China). He eventually became a body guard for Sun Yatsen and his family and later a “Brigadier General” under Chiang Kai Shek. 1) There is a terrific on line magazine called Asian Jewish Life at www.asianjewishlife.org. You will find much more detail on “Two-Gun Cohen” in one of their archival issues – this one to be exact! 2) In addition to his lecture in May, Rabbi Tokayer runs a series of highly-rated kosher tours of Jewish history in Asia. His next China-Japan tour is in July. You can find more information at www.jewisheyes.com. A blog post by Executive Director Marvin Pinkert. To read more posts by Marvin, click here.